This memorial gravestone lists the inscription that is on his gravestone in Philadelphia but this stone is so badly eroded that I can't read the whole information so I tried to follow the evidence of the churchyard where this stone tells us he is buried. The 5th Presbyterian Church (est. 1813) Churchyard on Mulberry/Mulburry St. is no longer in existence as reported by the Presbyterian church Web site. It became the Arch St. Presbyterian Church churchyard but it closed in 1867 and all burials were moved to Mount Vernon Cemetery which is closed to visitors by the owner. A very frustrating situation for those of us who like to take gravestone photographs. 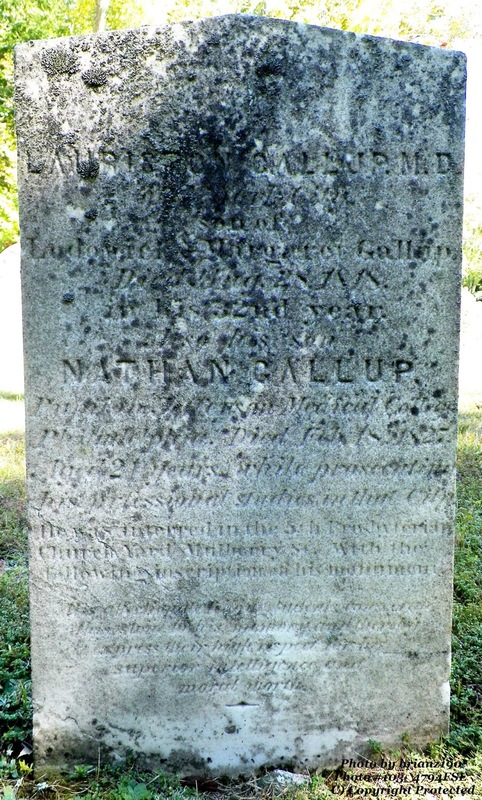 As Nathan died unmarried, all that is known of this is the records in the genealogies and on the gravestone in the Gallup cemetery in Ledyard. Nathan died 18 Feb 1827 in Philadelphia, Pennsylvania.